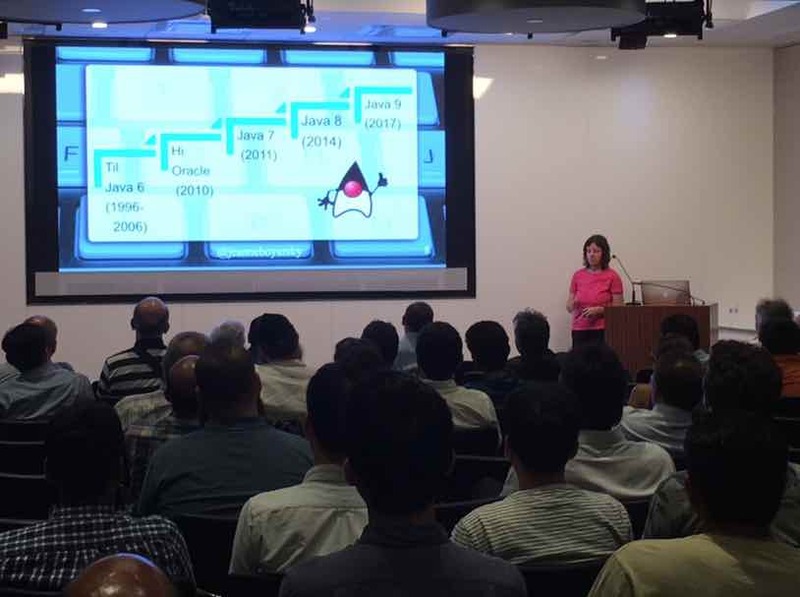 This week, I spoke at the NY Java Sig reprising my QCon Java 10/11 Release Train talk.It was fun. Last time I spoke at the NY Java Sig, I was the unplanned “opening act” for the main talk. This time, there were two planned speakers and I was one of them. I went second. The NY Java Sig was hosted by Credit Suisse. They had 12 remote attendees from their Raleigh, NC office. We were able to hear, but not see them. They were able to see me. I work on a distributed team so dealing with remote people I can or can’t see is just a part of me. I didn’t realize how much so until this presentation though. When I present, I try to involve the audience a bunch of times. They raise their hands, vote on stuff, etc. Almost every time I did that, I asked someone in Raleigh to comment on how the vote looked there. I got feedback at from the NY Credit Suisse representative that this was the first time that a speaker included them. (To be fair, most speakers don’t involve the NY audience either.) The really cool part is that I didn’t even realize I was doing it. It was just part of me; they were attending so I asked. For this particular presentation, I had offered a couple “free conference level training” available to any of our offices remotely. So I had practiced with people I couldn’t see as well. TSSJS – Presentation Slides Now Available! Our slides from TheServerSide Java Symposium are now available online for a limited time! You can view the presentations below, or click on the title link to view/download them on slideshare. 1. GWT Roundup: An Overview of Google’s Web Toolkit and Hybrid Integration, presented by Scott Selikoff. 2. Throw Away All The Rules. Now What Process Do You Follow?, presented by Jeanne Boyarsky.